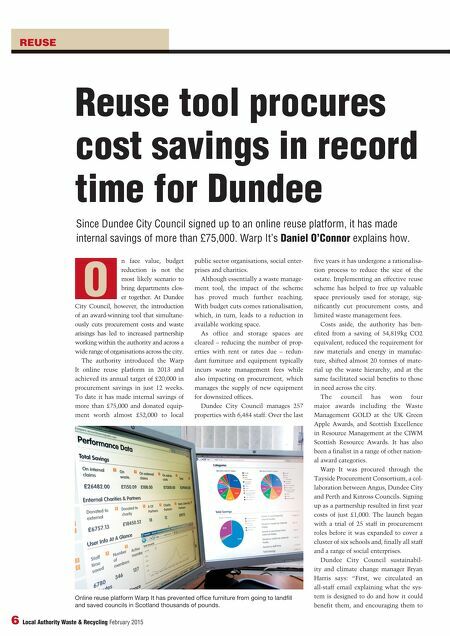 February 2015 Local Authority Waste & Recycling 7 REUSE register and start sharing resources to reduce the council's procurement spend. "We provided links to the council's dedicated Warp It intranet page and promotional fliers, as well as providing a user guide and answers to frequently asked questions. With turnover of staff, it's possible that new people won't be aware of the scheme, so we need to keep up momentum to maintain success – I'm certain everyone has a cupboard somewhere full of surplus items that schools or social work staff could use!" Members register on the platform, signing up to a code of conduct that covers the council for potential misuse of items. They then list unwanted items online, or search for available equip- ment. Items listed include everything from pianos and safes to electrical items and office consumables. With all perfor- mance data listed in the admin area of the site, Harris identifies that along with office furniture, storage items such as cabinets, cupboards and shelves are the most frequently listed. According to Harris, maintaining momentum during fallow periods with no office moves has proved problematic. However, working in partnership has meant that while the number of council- sourced items may fall at various times, other partners have been able to pick up the slack. 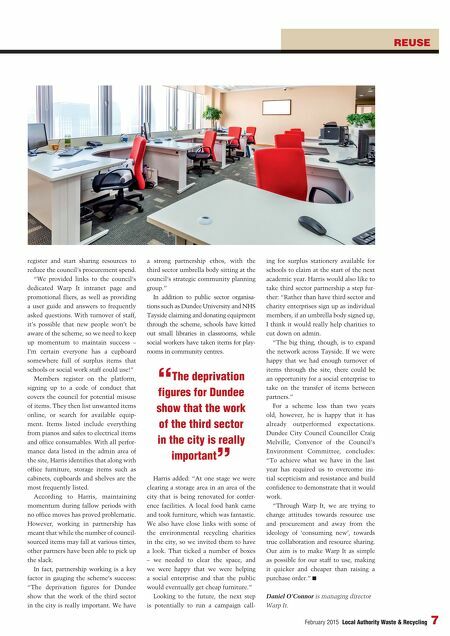 In fact, partnership working is a key factor in gauging the scheme's success: "The deprivation figures for Dundee show that the work of the third sector in the city is really important. We have a strong partnership ethos, with the third sector umbrella body sitting at the council's strategic community planning group." In addition to public sector organisa- tions such as Dundee University and NHS Tayside claiming and donating equipment through the scheme, schools have kitted out small libraries in classrooms, while social workers have taken items for play- rooms in community centres. Harris added: "At one stage we were clearing a storage area in an area of the city that is being renovated for confer- ence facilities. A local food bank came and took furniture, which was fantastic. We also have close links with some of the environmental recycling charities in the city, so we invited them to have a look. That ticked a number of boxes – we needed to clear the space, and we were happy that we were helping a social enterprise and that the public would eventually get cheap furniture." Looking to the future, the next step is potentially to run a campaign call- ing for surplus stationery available for schools to claim at the start of the next academic year. Harris would also like to take third sector partnership a step fur- ther: "Rather than have third sector and charity enterprises sign up as individual members, if an umbrella body signed up, I think it would really help charities to cut down on admin. "The big thing, though, is to expand the network across Tayside. If we were happy that we had enough turnover of items through the site, there could be an opportunity for a social enterprise to take on the transfer of items between partners." For a scheme less than two years old, however, he is happy that it has already outperformed expectations. Dundee City Council Councillor Craig Melville, Convenor of the Council's Environment Committee, concludes: "To achieve what we have in the last year has required us to overcome ini- tial scepticism and resistance and build confidence to demonstrate that it would work. "Through Warp It, we are trying to change attitudes towards resource use and procurement and away from the ideology of 'consuming new', towards true collaboration and resource sharing. Our aim is to make Warp It as simple as possible for our staff to use, making it quicker and cheaper than raising a purchase order." Daniel O'Connor is managing director Warp It. " The deprivation figures for Dundee show that the work of the third sector in the city is really important "